Polyglycolic Acid suture is a synthetic, absorbable, sterile, surgical suture composed of 100% glycolide. 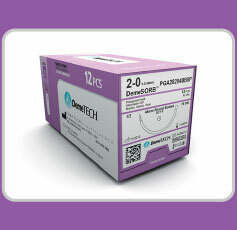 The chemical formula of DemeTech's PGA is (C2H2O2)n. Clinical trials have shown that after two weeks, approximately 84% of DemeTech's PGA initial strength remained. At four weeks, approximately 23% of DemeTech's PGA linear tensile strength remained. Sutures by DemeTech - Polyglycolic Acid Suture has been found to be nonantigenic and elicit only mild tissue reactivity during the absorption process.